Name: Enter a name for the crossplot. This name is displayed as the title of the crossplot. Density Plot (Binned): A density plot of the binned results. Point by Point: Colour code the crossplotted points using values from a third data set. This mode may not be appropriate for very large numbers of points. The example shows volumes containing acoustic impedance on the horizontal axis and VpVs on the vertical axis. Select the probe to define the extents of the analysis. Probes are required when crossplotting volumes. 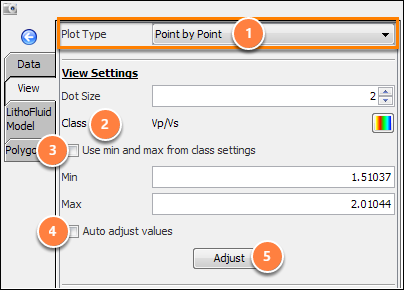 Plot type: Select how to display the crossplotted points. # Bins: The number of bins in the crossplot. Interpolation: Select the density information (see Changing the Display Interpolation Mode). 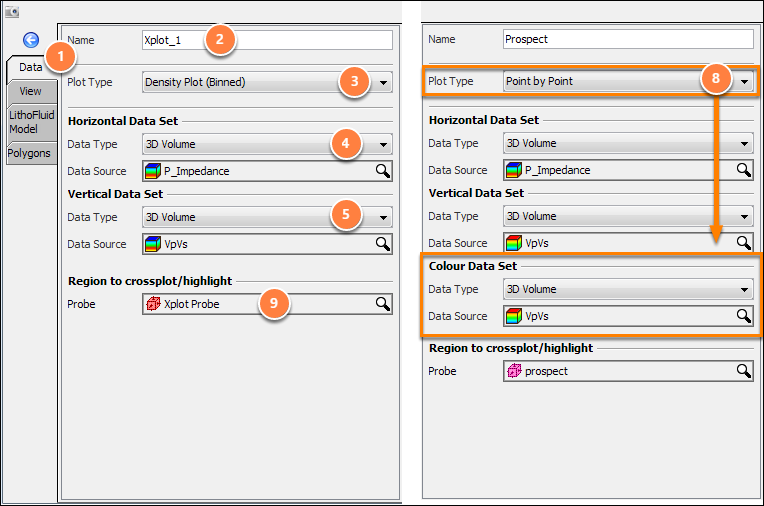 Point by Point: Colour code the crossplotted points using values from a third data set. Colour values use the Colour Data Set selected in the Data tab. Dot Size: The size of each point in the plot. Class: The Class settings for the Colour Data Set. Enabled: Use the min and max values from the Colour Data Set class. Disabled: Enter minimum and maximum values for the colour range. 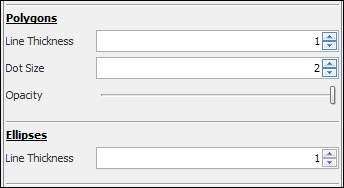 Auto adjust values: Enable this option to automatically update the minimum and maximum when the crossplot data changes. Adjust: click to set the minimum and maximum values from the available data. 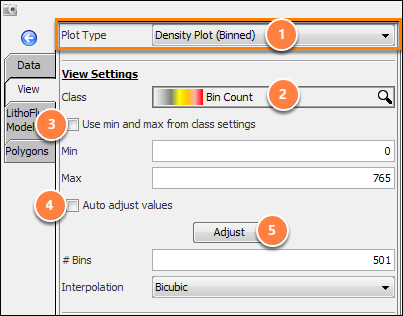 Configure labels, scales and ranges for the horizontal and vertical axes. Label: A label for the horizontal and vertical axes. Range: Minimum and maximum values for the horizontal and vertical axes. Grid Lines: Adjust the number of horizontal or vertical grid lines. Flip Axis: Flip the plot on its vertical axis. Note: To reset the range of the axes, simply right click on the plot and select Zoom to fit. Polygon and ellipse styles can be configured. (see Highlighting crossplot points (from sections), Highlighting geobodies (from crossplots), Using Litho-Fluid Models). Show Name: Display the name of the plot at the top. 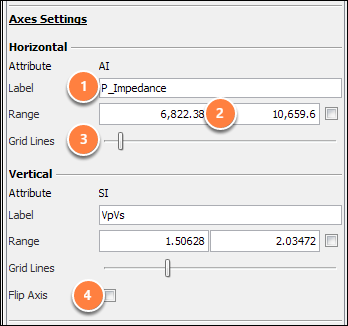 Show Axes: Display vertical and horizontal axis labels. Show Colourbar: Display the colourbar and its location.